A sophisticated blend of natural beauty and stylish appearance, there is a choice of sizes here. Durable, smart and eco-friendly, our Bamboo Collection offers innovative, lightweight camping chairs and tables in space-saving designs. Lightweight, foldable and easy to set up, the tables combine the benefits of bamboo for the tops with sturdy aluminium frames. The Calgary bamboo table - combination of natural beauty and modern design – your neighbour at the campsite will envy you. The portable table is compact and easy to carry yet very stable when opened. For picnic or camping the table fulfils your needs. The Calgary M and Calgary L are folding units that are easy to set up. Thanks to their clever combination of lightweight, quality materials, these Bamboo Tables offer lightness of weight plus durability of purpose, as well as a stylish look that is bound to be a topic of conversation on any campsite. 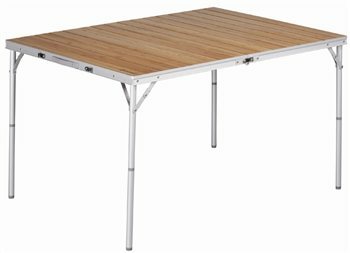 The table looks great and is light and portable. The downside of this is it is not that robust when putting up and down or moving it. We had to glue back the plastic retainer (ised when folded) for the legs as it came off in transit. Not a big deal as it doesn't affect it's use. Heat resistant, smart and much admired by our friends. Excellent product at an excellent. Query re delivery dealt with by friendly knowledgeable staff - and the table arrived on time. We will use you again. This is a really nice table, we have used it many times in the lower and upper position. As far as folding tables go this is a classic. However, please note that this table may not sustain the full weight of a large human.